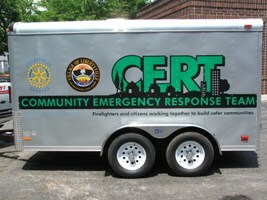 The Community Emergency Response Team (C.E.R.T.) program was formed in 2004. The program consists of 80-90 citizens from the Village that make up four different teams. These citizens are trained in a variety of subject areas such as first aid, the use of fire extinguishers, and search and rescue. The participants are equipped with a disaster response kit that will enable him/her to provide aide to anyone during an emergency. When members have completed their training, it is important for our department to keep them involved and practice their skills and abilities. It is for this reason that the teams train at least four times a year. The team will be used in large scale emergencies in the Village and can also be used during a pre-planned event in the Village. If you are interested in obtaining further information on the C.E.R.T. program, please feel free to contact Asst. Chief Ken Komers at (847) 362-5664.